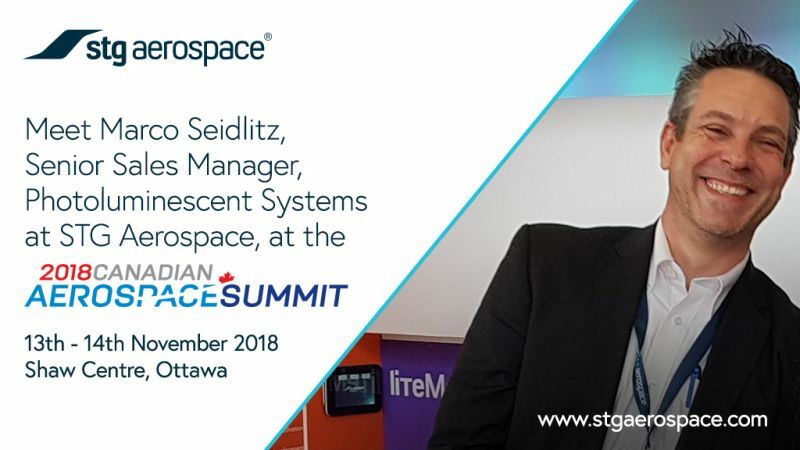 Marco Seidlitz, Senior Sales Manager, Photoluminescent Systems for STG Aerospace, will be attending the 2018 Canadian Aerospace Summit as part of a trade mission with the UK Department for International Trade. The country’s premier aerospace forum, this event is being held in Ottawa on November 13th and 14th. Some 1100 participants, including industry decision makers, government officials and academics, are expected to attend the combined conference and trade show which will provide STG Aerospace with the opportunity to gain new insights into the Canadian market and promote its innovative aircraft cabin lighting systems. Based in Germany, Marco is responsible for the worldwide promotion of STG Aerospace's market-leading saf-Tglo® emergency floor path markers and the informational saf-Tsign® range. In addition to marketing the company’s photoluminescent products as part of a total aircraft cabin lighting solution, alongside the company’s LED liTeMood® range, Marco also provides a specialist technical support role.